Stephanie Chen is used to making pavlovas but not on a small scale. 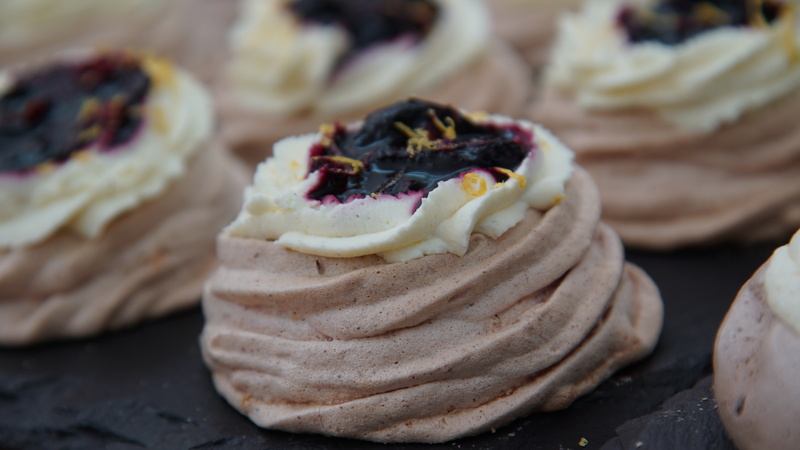 During the "Custard and Meringue Week" showstopper bake she is tasked with making mini pavlovas. One of which is a Strawberry Black Pepper Pavlova topped with a vanilla mascarpone and cherry balsamic sauce. Watch the full episode of "Custard and Meringue Week" from Season 2 Episode 6 of The Great American Baking Show. 1. Preheat oven to 355 F / 180 C. On a piece of parchment paper, trace 2.5 inch circles spaced at least 2 inches apart with a pencil. Should be able to fit 9 of them comfortably on each baking sheet. 2. Chop white chocolate into small pieces and set aside. Make sure they're small enough to fit through your piping tip. 3. Place egg whites in a stand mixer bowl with a whisk attachment. Whisk until soft peaks form. Slowly add caster sugar one tablespoon at a time and continue to beat until the egg whites become stiff and glossy. Don't over beat the egg whites or they will separate. When you can hold the mixture upside down without it falling out it's done. 4. Add white wine vinegar, chopped chocolate and black pepper. Using a large spoon spatula, mix very slowly and carefully by folding the mixture and egg whites. Sift in strawberry powder last and allow for some streaking in the mixture. Don't over mix or you will deflate the egg whites. 5. Using a little pavlova mixture, apply on the corners of the parchment paper (same side you drew on, then flip over parchment paper so it's pencil side down on a baking sheet. 6. Add meringues to a piping bag and use large star tip. Pipe into the circles and clean it up with an offset spatula. Make sure you are FILLING them completely when swirling. 8. The way to tell when the Pavlova is done cooking is when it looks crisp at the edges. The tops will be dry but if you press on the underside it'll give a little since the centers are still soft and squishy. If you tap them lightly they should also sound a little hollow. 1. To make Cherries Compote: Add cherries, sugar, lemon zest and juice to a sauce pan. Bring to a simmer and reduce liquid down to about ½. 2. Add 2 teaspoons of cornstarch and 1 tablespoon of balsamic vinegar. Break up the cherries once softened. 3. Reduce heat and let cool completely. 1. Scrape vanilla beans out of vanilla bean pod. 2. In a CHILLED stand mixer bowl, add whipping cream and vanilla beans. Fitted with a whisk attachment and beat on high until mixture is fluffy. Remove and set aside. 3. In the bowl, add sugar and mascarpone cheese and whip together. Taste then lastly add in vanilla extract if vanilla flavor isn't strong enough. 4. Fold in whipped cream and mascarpone mixture together. 1. Take the Strawberry Pavlova and top with mascarpone cream and then cherries on top with a drizzle of sauce.